Nomads womens retro handloom tailored blazer. Retro style blazer in 100% fair trade cotton, woven using traditional handloom techniques and skills. Single button fasten with 2 patch pockets. Unlined and lightweight, ideal retro inspired summer work wear - match with the Nomads handloom pencil skirt and handloom shirt for a vintage look work or smart formal outfit. - Nomads retro 1970s Handloom women's tailored blazer. - Chambray blue and white retro pattern with orange highlights. - Handloom cotton fabric made by traditional artisan techniques. - Single breasted with single button fasten. Nomads Handloom tailored pencil skirt in chambray blue. Using traditional artisan Handloom techniques and skills, this 100% fair trade skirt is fantastic for summer in a cool chambray blue and white retro 70s woven pattern. Tailored, traditional fit in a slightly A-line pencil skirt shape. The skirt is midi length, falling just above the knee. Match with the tailored handloom blazer for a retro inspired 70s skirt suit, and team with the handloom Nomads shirt for a fully ethical, 100% fair trade, vintage inspired outfit, fab for work or smart, formal occasions. 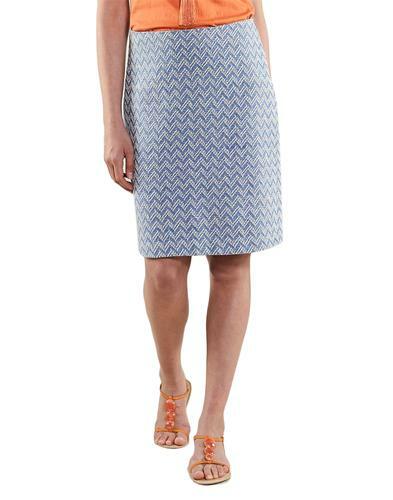 - Nomads Retro tailored handloom pencil skirt in chambray blue. - Classic pencil skirt fit and shape. - Traditionally made handloom woven fabric. - Wear with the matching blazer or coat for a retro inspired work wear or smart outfit. Composition: 100% cotton with 100% viscose lining. Nomads womens handloom shirt with retro pin dot pattern. Periwinkle blue chambray cotton fabric, made with traditional handloom techniques. 100% fair trade. 3/4 sleeve with retro button tab roll up (or wear down). Retro wooden button fasten with Y-neck collar. Ideal summer workwear in a lightweight, breathable cotton and collarless design. Pair with the Nomads handloom skirt suit for a fab retro inspired summer work outfit, or wear with jeans for a casual look. - Nomads womens retro handloom shirt in periwinkle blue. - Chambray cotton fabric with woven pin dot design. - Handloom woven using traditional techniques. - 3/4 sleeve with optional turn up button tab. - Retro Y-neckline with henley collar. - Scooped hemline, slightly longer at the back. Care: 30' cool wash. Check label for info before washing. 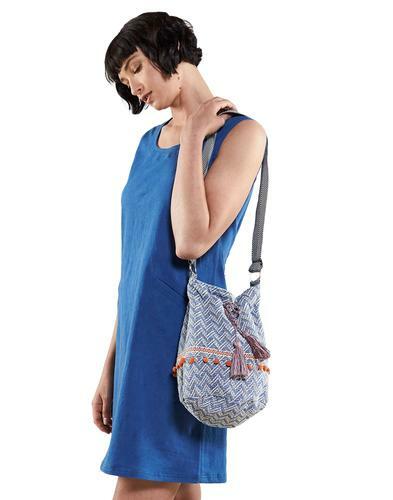 Nomads Retro Vintage 1970's fair trade Women's Bucket Bag with fully lined interior providing generous space for all of your summer essentials! The exquisite blue tone complements an intricate retro geometric pattern accompanied with beautiful modern chevrons, tassels and adorable little pompoms giving you a fabulous summer look! You can also pair this up with the stunning Nomads Retro 1970's Handloom Jacket! - Inside zip patch pocket to keep your belongings safe. - Modern chevrons,tassles and orange pom poms decorate the bag.